If you’re the kind of person who’s clued in to RealTime it’s likely pretty rare that you come across an artform you’ve never even heard of. Hence the considerable buzz surrounding Circa’s recent collaboration with a group of mallakhamb performers: even in the form’s homeland of India, mallakhamb is hardly mainstream stuff, and the almost millennium-old discipline was on the verge of dwindling into extinction until a recent resurgence of interest. 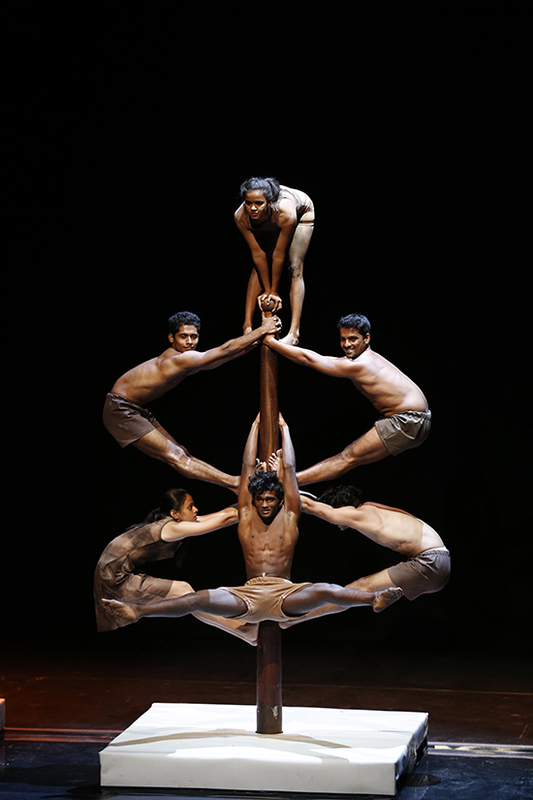 Mallakhamb centres on an imposing wooden pole of the same name, about two and a half metres tall and securely anchored so that feats of balance and strength can be performed around and upon it. There are other modes, including hanging mallakhamb, in which the pole dangles from a rope, and rope mallakhamb, which omits the pole entirely. It’s a fascinating form, not least because it’s not quite like anything else. It’s often compared with wrestling, martial arts, gymnastics or contortion, but to me the performance styles I was reminded of in Circa’s One Beautiful Thing are bodybuilding and pole dancing. A series of physically impressive poses makes up each routine, performers twisting or straining their bodies into painfully demanding shapes and then holding the pose for the viewer to appreciate. It’s as stripped back as the almost naked men performing, the possibilities of the human form producing the limits of the work’s intent. Director Yaron Lifschitz’s program notes make reference to more transcendental themes throughout the work’s three parts, but for me the sheer materiality of the mallakhamb exerts a dense gravity far more compelling than any metaphors or allusions that might otherwise arise. It seems a mostly gendered sport, with rope mallakhamb largely performed by women and the polework a male domain. The spectacle of muscularly defined men engaging in a particularly masculine form of pole dancing is a long way from the Western gendering of the same. Not that mallakhamb upsets any familiar divisions of the body and the gaze, culturally camped more as a sport than a dance, but its very division into gendered lines is hard to ignore. Plus, there’s the leg-crossingly visceral moments in which men perform a high-velocity forward flip that impacts the pole at crotch-level, thighs catching them in place to freeze the pose. The rope mallakhamb performers present more familiar images, their climbing and aerial posturing more seamlessly stitched into the Australian components of One Beautiful Thing. The local contributions seem to complement the Indian elements, focusing on group balance work, rope and strength, but where the overall production falls down is in creating something that is more than the sum of its parts. The various sequences of mallakhamb in several modes are bewitching in themselves, but the more recognisable interspersed circus and dance requires that the audience find the points of connection and departure that justify their inclusion. It’s somewhat like a fascinating conversation that’s just out of earshot. The range of voices speaking throughout the Next Wave one-off event Lukautim Solwara (look out for the ocean) is even more impressive—not just from the performers, who include Maori, Pasifika and Aboriginal artists, but from the dialogue between their contributions to the evening and its setting within the current Sovereignty exhibition at ACCA, a wide-ranging collection of works by First Nations people of SE Australia. Lukautim Solwara could be positioned in a similar space to the club acts that have propelled some of the most interesting performers of this century into prominence, and its individual performances were dispersed throughout the meandering ACCA exhibition space across the course of one night. 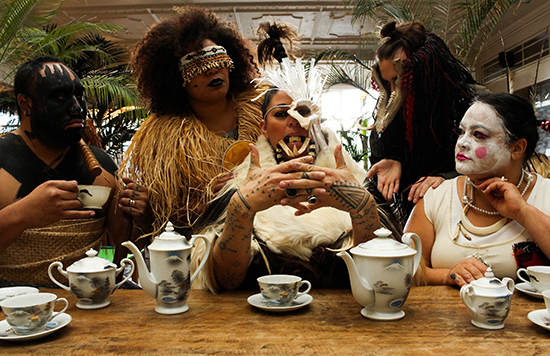 The event was led by Samoan artist Rosanna Raymond, whose presence throughout the evening was striking and memorable, her quite astonishingly accomplished command of adornment as a way of commandeering the historical visual representations of First Nations peoples was here expanded across the bodies of her collaborators. The parade of deity-like characters who kicked off proceedings set the tone. 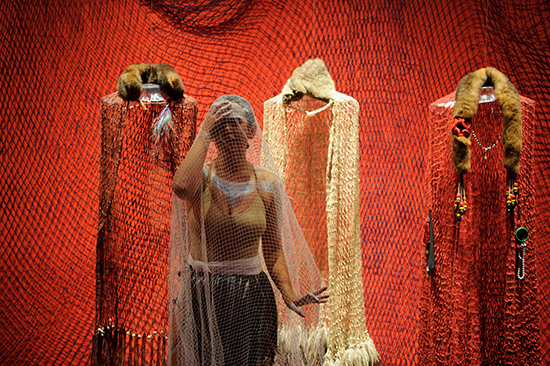 Each was an assemblage of parts—grass skirts, body paint, nets, headdresses, armour, pearls—that accumulated to engender a character both mythic in scope and utterly unique. These were characters in both of the contradictory senses of that term, as a universal type and a distinct and solitary individual. The scattering of these figures across the space produced varied results, from acts that explicitly responded to the existing exhibition (Amrita Hepi’s dance with its costumed echoes of Destiny Deacon and Virginia Fraser’s “Something in the air”) to sequences that could carry just as much resonance without reference to the setting. Lukautim Solwara was the product of an intense, 10-day period of collaboration and while its one-off nature gave it an ephemeral aspect it was a solid introduction to, or reminder of, a spread of talents of considerable power.